Ian Woodward's Investing Blog » Kahunas Volleyed and Thundered! 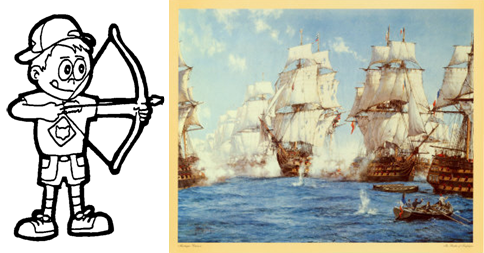 Yesterday, I warned that we had a shot across the bow, and today the shots are at the bow as Kahunas volleyed and thundered! I have captured yesterday’s view below that shows that there was just one big Kahuna on the DOW and three Little Kahunas. 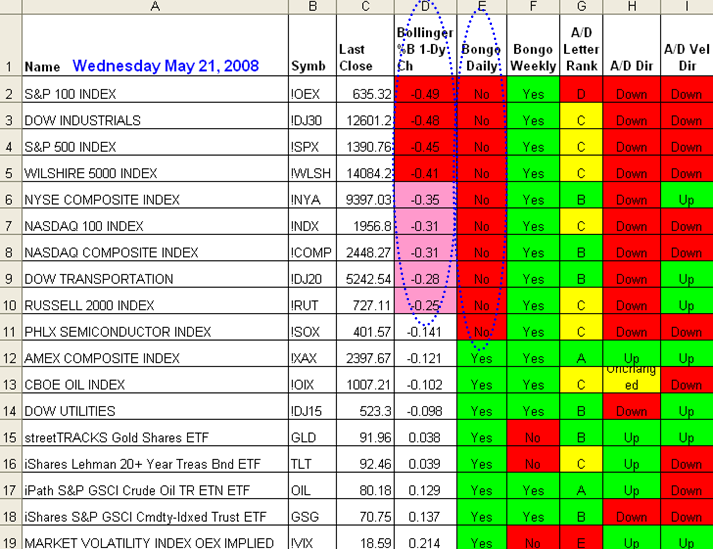 Also we had three Bongo “No” signals suggesting that these were weak Indexes. Now look how the picture has deteriorated one day later with four big and five little Kahunas today and the Bongo signals have expanded to ten “No”. In addition, note that we had two Big Kahunas in a row on the DJ30, which suggests it is time to take defensive action sooner rather than later. It goes without saying that all the favorite Wolf Packs got hit today with heavy profit taking and we will have to watch whether the continued rise in the price of a Barrel of Oil to over $133 today is now showing signs of a climax run or just a minor bubble before the big run up finally bursts that bubble. 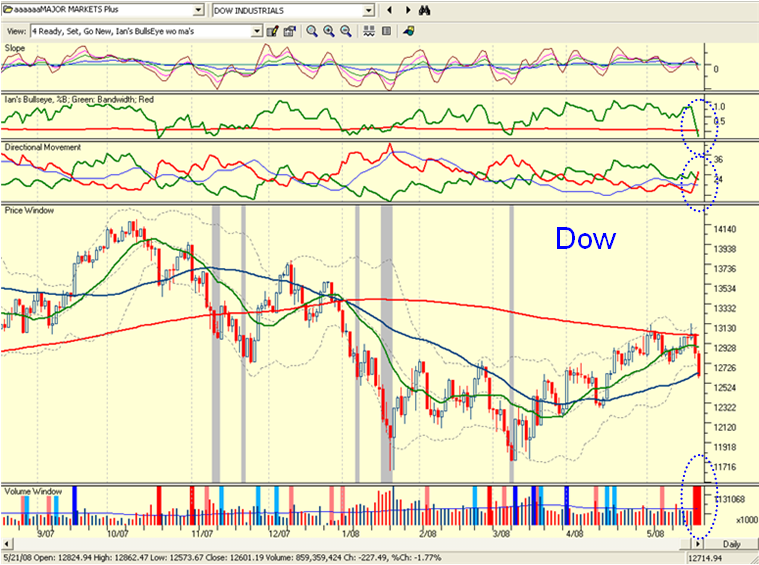 So that you have a feel for the value of seeing the Kahunas in action, here is the chart of the Dow showing the two Big Kahunas in a row at the bottom right of the chart. Also note that the Directional Movement and the Bull’s Eye with the %B coming down through the Bandwidth confirms that this is probably not a storm in a tea cup, until we see a quick reversal upwards. 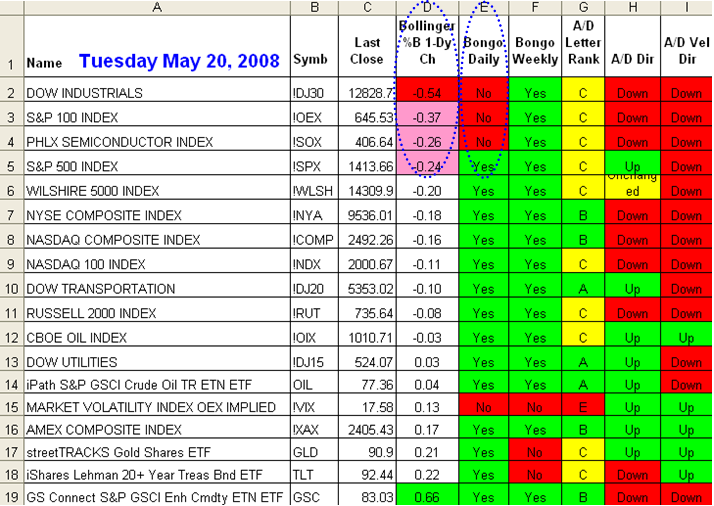 This entry was posted on Wednesday, May 21st, 2008 at 5:10 pm	and is filed under HGS Principles, Market Analysis. You can follow any responses to this entry through the RSS 2.0 feed. Both comments and pings are currently closed.